FROM THE US OPEN – Can we call Tremendous Tuesday? Sure were can, with four fantastic matches. 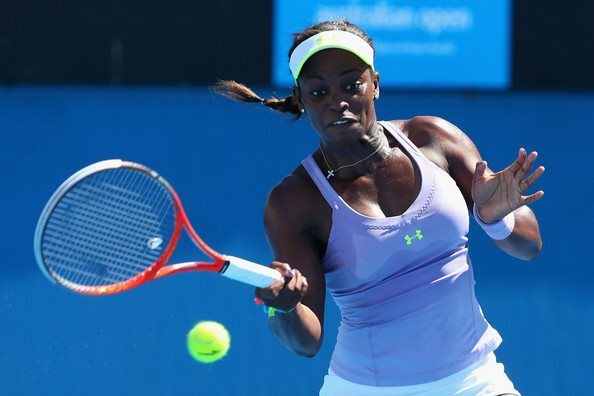 Let’s start with the 2017 US Open champ Sloane Stephens, who will face Anastasija Sevastova. In her last two matches, Stephens was super steady, strong and fast. Mentally, she is focused. When she gets an opportunity, she runs forward. Sevastova has incredible variety, especially with her drop shots. She can be fairly quick, she can run ahead or back, and she is very emotional. They will split sets, they will have numerous rallies, and then it will be finished, with Stephens raising her arms and smiling. She will advance into the semis. Who knew that John Isner was able to take down Milos Raonic in five sets? The American is playing so much better than he did last year. Currently, he is analyzing his options and he is going for it, with his huge serve. At the net when he is on top of the ball. However, he has to play against Juan Martin del Potro, who is on fire, and his backhand is substantially better than he was a couple years ago. His serve is massive, as is his gigantic forehand. Like Isner, del Potro is pretty clean at the net. He bends down to put it away. This has to be a five-setter, and both of them want it very badly. There won’t be a lot of rallies, but here and there, they will go side-to-side and hope they can strike winner. To me, the former US Open champ del Potro has been better over the years — when he wasn’t injured — and this week, the Argentine is playing amazing ball. He will win 7-6 in the fifth set. Serena Williams is playing better than she has since she returned in March. Her serves are very hard, her first serve and the second serve are bombs, her backhand down the lines is very clean, and her forehand is deep. Almost out of nowhere, Karolina Pliskova is confident again and she is cracking the ball. Pliskova has had a mediocre year, but when she feels good, she will put together her first serves, ace after ace, and she will immediately go for the lines. Two years ago, the Czech beat Serena 6-2, 7-6(5) in the semis. That was then, that is now. They have changed, both of them got married last year, and Serena had a baby. Times change, and off court, they are very happy. Pliskova will immediately attempt to out-hit Serena, but the American is steady now, and she is returning very well. Serena will win 7-6, 7-6, but it will be a tough contest. Rafa Nadal is the No. 1. In the last two matches, he looked very good at times, and so-so at other times, too. The thing is though, even when he is not serving the right way, his backhand is too short, and he isn’t attacking enough when he was returning, still, he is so smart and he readjusts. The key is that he wins. Can he best Dominic Thiem on Tuesday night? I would think so, because Nadal has beaten him seven times against three losses — all on clay, especially at the 2018 Roland Garros final, when the Spaniard won 6-4, 6-3, 6-2. Nadal is just better than he is. However, Thiem played well last week, he likes to hit heavy spin, he has a terrific first serve, and he is fast, too. But on the hard courts, I just can’t see a Thiem victory. Nadal has won Flushing Meadows three times, while Thiem has never reached the semis. It should be a fun match, with some wonderful rallies, but Nadal will win in straight sets.